Rock with glowing blue eyes. 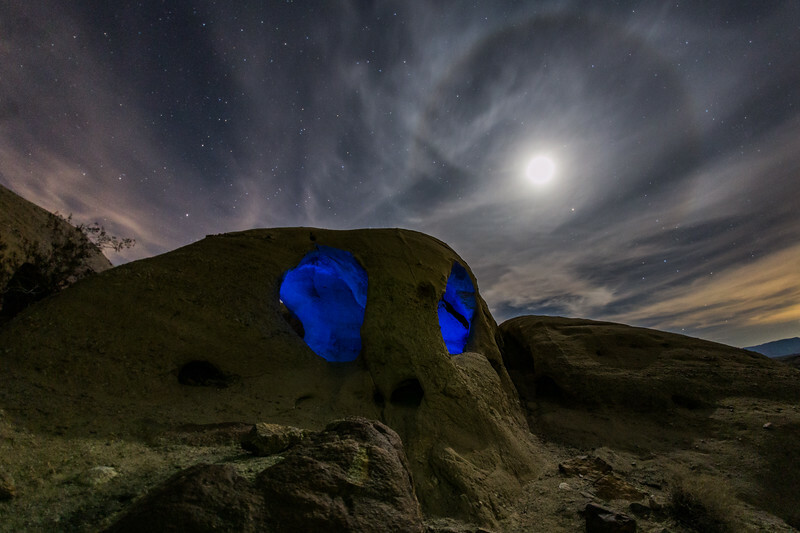 Skull Rock and a 22° Moon Halo. Take 1. This sandstone rock sure looks a lot like a skull, doesn't it? This image is not Photoshopped. I used blue glow sticks to light up the "eyes". The Wind Caves are accessible from the northern end of Split Mountain. The trailhead is marked on Google maps. A high-clearance vehicle is a must as the road inside Split Mountain is littered with medium and large rocks. You should be OK with 2WD as long as you don't stray from the established path. My Titan has 4WD, but I didn't need to use it. Once you get to the trailhead - which is marked with a sign reading "Wind Caves", it's a moderate one mile hike up and over a hill to the caves. "On the eastern edge of Anza-Borrego Desert State Park lies Split Mountain, the Carrizo Badlands, and a feature known as the Wind Caves. Here, the exposed sandstone of the marine beds from the five-million-year-old Imperial Formation have been slowly eroded by wind into fantastic shapes that evoke whimsical images of boats with portholes, spaceships, and even the fictional town of Bedrock, hometown of the prehistoric Flintstone family." A 22° halo is a halo, one type of optical phenomenon, forming a circle 22° around the sun, or occasionally the moon. It forms as sunlight is refracted in hexagonal ice crystals suspended in the atmosphere. As the light beam passes through two sides of the prism forming a 60° angle, the angle of minimum deviation is almost 22° (namely, 21.84° on average; 21.54° for red and 22.37° for blue). This wavelength-dependent variation in refraction causes the inner edge of the circle to be reddish while the outer edge is bluish. A 22° halo may be visible on as many as 100 days per year. 1. San Diego Reader / The Canyoneers. Canyoneers are San Diego Natural History Museum volunteers trained to lead interpretive nature walks that teach appreciation for the great outdoors.